I guess the 88% dark looks the same as the mint. Trust me, it is ferociously dark. One of my sophomore year college courses featured extensive reading and discussion from the Bible. I remember in one class, we were struggling to get our heads around some New Testament passage dealing with sin and death. Attempting to shed some light on the issue, one of the professors recalled the first few chapters of Genesis, commenting on when God lays down the penalty for disobedience on Adam and Eve: “It’s as if God’s saying, ‘Hey, you’re gonna have to suffer. '” Something about that clicked for me. We live in a fallen world. Of course we’re going to suffer. God takes us as we are. He calls us out from being part of the problem, the cosmos gone awry, to getting involved in the solution. And sadness is a reasonable, natural, even inevitable response to the state of the world. Paul explains it this way: “For the sorrow that is according to the will of God produces a repentance without regret, leading to salvation, but the sorrow of the world produces death” (10). Instead of lamenting all that’s wrong with the world while turning a blind eye to one’s own role in the disaster, or stewing in guilt and self-loathing when confronted with one’s personal evil, Paul advocates repentance. God can use your sadness to turn you around, if you let him. He can change you, lead you out of vice and ignorance and regret, and bring you into goodness. And that’s precisely what’s happened to the Corinthians. Paul writes, “For behold what earnestness this very thing, this godly sorrow, has produced in you: what vindication of yourselves, what indignation, what fear, what longing, what zeal, what avenging of wrong! In everything you demonstrated yourselves to be innocent in the matter” (11). Remember where he left them in his last letter, riddled with problems and conflicts? They stepped up. They struggled. And they came together in repentance. Joy doesn’t come easy, but when God calls you to do something good with your sadness and you step up, on a long enough time frame you’ll see change and find joy. If there is in fact an all-powerful and all-good God involved in the process, it’s guaranteed. We’ve seen in the psalms that comfort rarely comes overnight. Confronted with all that’s wrong in the world, right down to us, we move from orientation to disorientation, and sometimes we stay there for years before we move into new orientation. 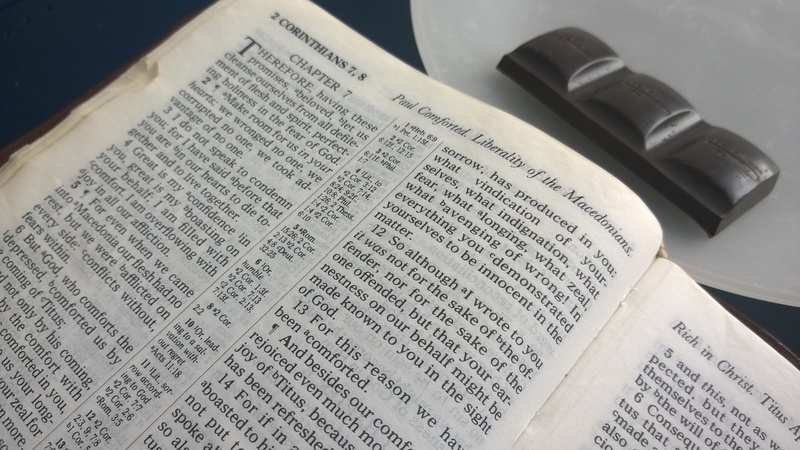 But if the badness of the world has you down–even sorrowfully, aggressively, pervasively down, down to the core–Paul’s teaching lets us know that God gets down in the thick of our downness to comfort us. Our sorrow may hurt, but it’s not futile. God is at work in the world, and for that reason, we can join him and do something good with our sorrow. Posted in 2 Corinthians, All the Paul, Daily Reading, New Testament, Topical Studies.Tagged 2 Corinthians, bible, christianity, depression, devotional, God, paul, repentance, sorrow, spirituality, suffering. We often ask for comfort for others and can/should ask for comfort for ourselves as well. True that. Spiritual self-care is important!